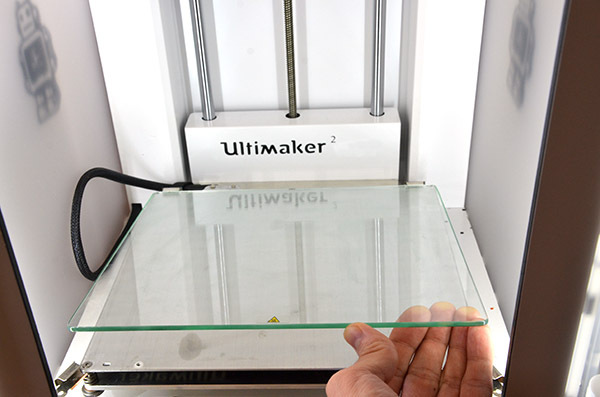 Here's a few tips for users who are completely new to using the Ultimaker2. When you first start your Ultimaker 2 it will guide you through most of this process but we've added a few tips and pictures to make it easier to understand as the little display is limited in how verbose it can be. We recommend that you read through the whole page before you start so that you have an idea of what to expect. The very first thing you will do after unpacking your printer is to level the printing platform. The printer will prompt you for this and guide you through the process when you first power it on and you will not be able to continue until you have completed this step. Make sure that you have removed the piece of cardboard underneath the printing platform before you start. To remove it you manually lift the bed by grabbing it towards the back of the machine and pulling it upwards. 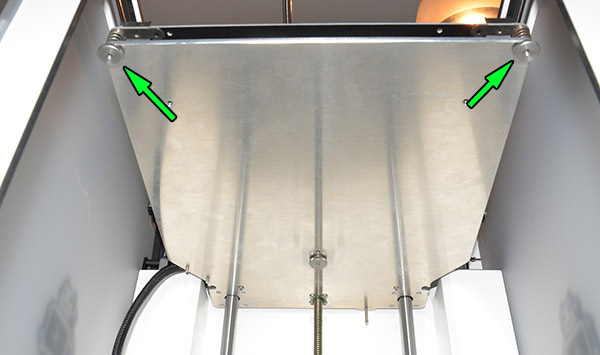 Push the glass plate into the clips in the back of the printer. Sometimes it helps to tilt the glass at a slight angle. You might need to jiggle the glass around a bit as you push it towards the back of the printer to get it to slot into the clips. Finally lock the glass in place by rotating the front clips back. Now you're ready to start the levelling guide. The process is fairly straight forward but we have a few tips. The guide will start by "homing" the bed and print head. This simply means that the printer will lower the bed to its bottom location and move the print head to the rear left corner. This gives the printer a known starting point. Next the head will move to the center back of the machine and raise the bed. You will now be asked to adjust the nozzle distance to the glass plate by turning the button on the front of the machine. Spin the menu button until the nozzle is roughly 1mm from the bed. This measurement isn't critical, just get the nozzle close without letting it touch the bed. Press the button when you're happy and the head will then be moved to the front left of the printer. Adjust the distance once more to be roughly 1mm from the bed. But this time you will use the left thumbscrew underneath the bed to adjust. When you're happy, click the menu button and the head will move to the right where you will repeat the same thing again. The process will now be repeated and this is where you will dial in the distance perfectly. The print head will once more move to the center back of the printer. Once more you will use the menu button to adjust the height. Now you will use a piece of paper as a height gauge. Slide a piece of standard printer paper underneath the nozzle and then turn the menu button until you can feel a slight drag on the paper. If necessary you can fine tune the height with the third thumbscrew underneath the printer. Click the button when you're satisfied and repeat the same procedure for the front left and front right position using the thumbscrews once more. An alternative to using the paper is to simply look at the reflection of the nozzle on the glass. Once you've done the bed levelling procedure a couple of times you might find that this is quicker as you will now have a better feel for it. Look for the nozzle to meet it's own reflection and then back off slightly. The distance shown in the right image is slightly too large but it made it easy to see how you can "measure" the distance by looking at the distance between the reflection and actual nozzle. If you feel the bed levelling is off you can restart it via Maintenance -> Build plate. You can also fine tune it with the three thumbscrews during a print. The next step after levelling the bed is to load material. The head will move to the front of the machine and the print head will then start heating up. Once the print head has reached printing temp you will hear how the feeder motor on the back starts moving. While all of this is happening take the time to prepare the filament. It is helpful if you cut the filament at an angle to make it easier to insert. You also want to make sure that the bowden tube is straight. Due to the packaging of the printer, the bowden tube is bent down a bit. 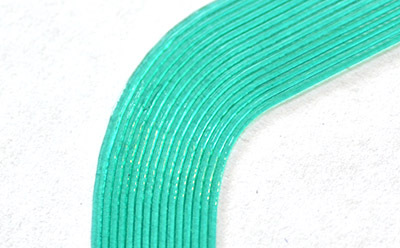 This bend introduces unnecessary friction for the filament and you will want to straighten it to avoid this. Once it's time to insert the material simply push it into the feeder. You need to use a bit of force to get the feeder to get a grip on the filament, it is not enough to simply hold the filament at the entrance. It can be difficult to see if the material is moving into the feeder at first. Press your finger against the filamet at the entrance of the feeder and you'll feel if it is moving or not. 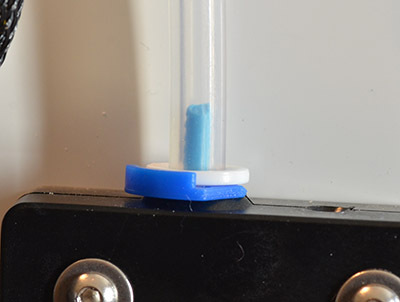 When the feeder has grabbed your filament, wait until you see it exit the feeder and enter the bowden tube like in the picture below. Once it does, click the menu button and the printer will start pulling the material in and wait for you to confirm with another button click that material is exiting the nozzle. 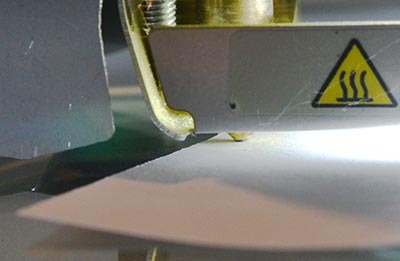 If you hear ticking sounds before the filament has started exiting the nozzle it could be that it has caught on an edge in the nozzle (this is why it's helpful to cut the filament at an angle). First try to wiggle the bowden tube at the head a little bit, bend it back and forth a bit and that usually allows the material to pass. If that doesn't work, you can try to help the printer by applying manual pressure at the feeder end. Grab the filament and push it hard upwards. If that doesn't help you can do the opposite and actually pull the filament backwards so that the printer gets a new shot. This could be scary the first time you do it but don't worry, you will not damage the printer by doing this. Generally this isn't an issue though. When applying glue to the platform it is recommended that you make it a thin even layer. The easiest way to do this is to smear on a thin layer of glue and then spread it around with a damp cloth. While the bed heats up the water will evaporate and leave a very thin film of glue behind. You will barely be able to see the glue once the water has evaporated. The printer comes with a glue stick from Pritt. While this glue works ok we've found that the Tesa Easy Stick (for Swedish customers only) that we sell works much better. 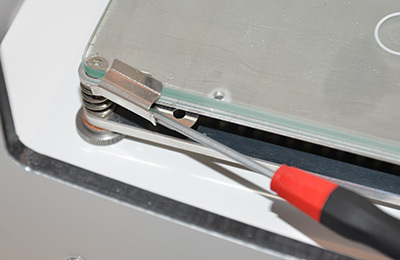 This might seem a bit obvious but we recommend using some sort of tool when removing the clips on the platform as they are quite sharp. Use something like a screw driver to lever the clips out. To clean the glass it is enough to use some warm water to dissolve the glue. You might want to use some dish soap to get rid of any oily residue from your fingers as well. Dry the glass off and re-apply glue as instructed above. You do not need to do this after every print. How often it needs to be done depends on how often you print, if you get the platform dirty or if you scrape away a lot of glue when removing prints. 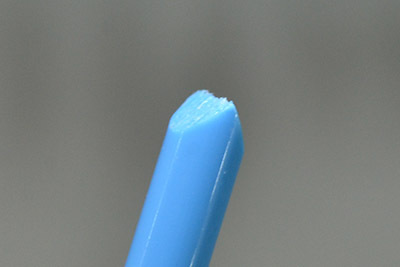 With PLA it is also possible to print without any glue at all. In this case the plate must be absolutely clean as any small oily fingerprint can ruin bed adhesion. For simplicity we recommend to use a bit of glue. The UM2 is quite sturdy and will handle being moved around without any trouble. A couple of things should be kept in mind though. When you lift the printer you should make sure that you do not put pressure on the axes as you risk bending them if you do. Also be mindful of the belts. In short, lift it by grabbing the frame only. When you perform maintenance on the head, like performing an Atomic, it is a good idea to move the head to a corner of the printer. That way you don't risk bending the axes. You can move the head by simply grabbing it and dragging it where you want it to go, this will not damage the printer (unless the head is stuck and you use very excessive force). If the head seems to be stuck it could be that the stepper motors are engaged. Power cycling the printer will power off the steppers and you should be able to move the head. If the axes move but feel stiff, you might need to give each axis a drop of sewing machine oil. If you need to move the platform up or down you can do that by grabbing the platform as close to the back of the printer as possible. Do not lift it by grabbing the front of the platform as you would then risk bending it. To move it down, press down at the back of the platform. From the main menu choose Material -> Change. The printer will move the print head to the front of the machine and start heating up the nozzle. Once the print head reaches print temperature it will start ejecting the filament. You might need to give the filament a little tug if it's still stuck in the feeder. You will then load the filament in the same way we described above. Once the new filament is loaded you will be asked which profile to use for it such as PLA or ABS. One very important thing to note here is if you're switching from a "high" temperature filament such as XT to a "low" temperature material such as PLA, it is important to "flush" the nozzle. Since the higher temperature material might not be fully melted at the temperature that the new material uses it can cause feeding issues. One way to do this is to print with the new material at the old temperature for a couple of minutes. You can do this by starting a print and then going into the Tune menu and raising the temperature temporarily (this change will revert on the next print). After a couple of minutes you can simply abort the print and you're ready to start printing with the new material. A better method in our opinion is to perform a so called Atomic which will empty out the nozzle completely. It has the added benefit of cleaning the nozzle a little bit as well. It can also be a good idea to do this if you're switching from a strong colour like red to white. Even tiny amounts of red filament will be very visible in the print. By performing the Atomic you get rid of all the red plastic from the nozzle. Don't forget to whipe off the outside of the nozzle as well. We like to wipe the nozzle whenever we start a new print. Though not strictly necessary it helps to prevent old plastic from burning into the outside of the nozzle. Immediately after a print is done, the plastic closest to the platform will still be fairly soft. It is therefore important that you wait a while before trying to remove your print. The display on the printer will show when the platform is cool enough to do so. Besides the lower part of the print being soft, the part is usually stuck very hard to the platform as well. When you allow the print to cool down the print will shrink ever so slightly compared to the glass which will make it more or less pop off the platform by itself. The glue will of course also help hold it down, but if you let the bed cool down fully it will be quite easy to remove it. It is helpful to use something like a putty knife or similar thin bendable blades (a box cutter works in a pinch) to get underneath the print and pry it off. We sell a tool kit (Swedish customers only) that includes such a tool but any hardware store will sell something similar. You've unpacked your printer, completed your first print and you're ready to get going with your own projects. We recommend taking a look at our other guides to learn more about your printer and the printing process. You can find them all on our support site. A good starting point is our Basic maintenance guide and our Getting better prints guide. Should you run into problems with your print, the Visual troubleshooting guide is also a great resource to quickly diagnose and get tips on how to correct issues you might be having. You can use any 3D design software you like, as long as it can export STL-files which is the standard format that is used. If you don't want to create your own models to print there's an almost endless number of free models that you can download from sites like Youmagine and Thingiverse. Once you have your model it's time to prepare it for printing. The software to use for that is primarily cura. There are other so called "slicers", but start with cura as it is designed by Ultimaker and especially suited for Ultimaker printers. A great resource is also the Ultimaker Forums. There you'll find lots of like minded individuals that are eager to help you and discuss projects or ideas.